Makena, Maui. Simply stated, one of the most beautifully custom detailed homes to ever be built on the island. The home perched on a lushly landscaped 1-acre parcel of land entertains endless Pacific Ocean views. With 8 bedrooms and more than 10,000 sq. 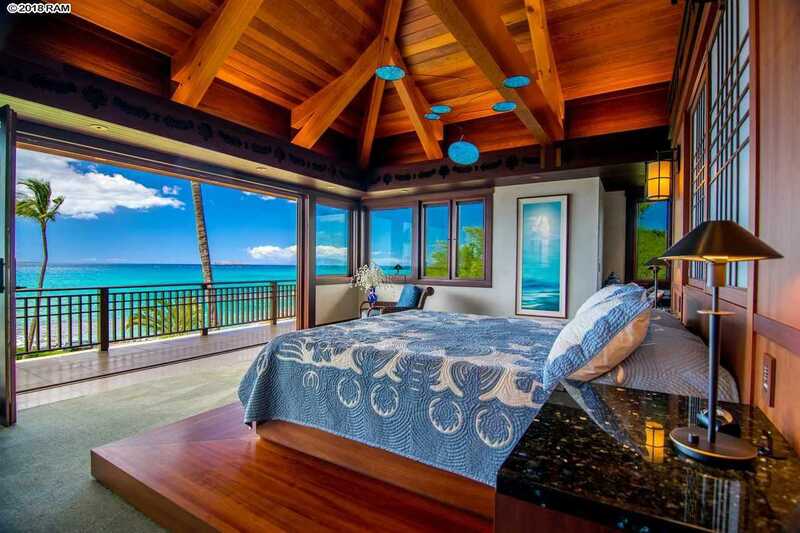 ft. of interior living, one can enjoy the true essence of Hawaiian indoor-outdoor living. The main home features a plethora of custom wood detailing, fountains, ponds, movie theatre, ocean views with privacy. An additional pool house provides more bedrooms, a full kitchen and a living room to enjoy Makenaâs great weather while lounging around the resort-like setting. In the evening, an outdoor theatre rises from the pool deck, allowing for some of the most epic private cinema opportunities a residence can offer. A large entertaining venue with nearly 4,000 sq. ft. of deck and outdoor furniture can accommodate large parties under the stars. Capping off this truly one of a kind property is a 6-car garage & caretakerâs quarters. The photography helps to tell the story of this beautiful estate. Please, send me more information on this property: MLS# 380942 – $23,500,000 – 7505 Makena Rd, Kihei, HI 96753.